Vote 4 immigration reform! Call your senator! DENVER - Sheridan Health Services will be on Un Dia Sin Fronteras with Tim Paynter on Monday, March 24th, 2014. Representatives of the clinic will discuss the need to have health insurance. They will also speak about how to gain access to medical services. Many people have yet to take advantage of the Obama Health Care Reform measures. The lag is especially large in the Latino community. No wonder, there is a chasm of distrust in the administration over record deportations and strong immigration enforcement. Hence, many people are afraid or distrustful of the system. Unfortunately, undocumented immigrants won't qualify for Obama Care, as it is called. They can still find access to health care through special clinics like Sheridan Medical. Talk show host, Tim Paynter will discuss issues of access and health with clinic representatives. Sheridan Health Services can be reached at 303.781.1636. What Do You Think About Immigration Reform? Gregorio Uribe Big Band And Beatles At Zinc! If you love Latino music you won’t want to miss the event at the Zinc Bar tonight! Colombian composer Gregorio Uribe will be at the NYC venue with the Big Band Latino. So will the Beatles…in spirit. Uribe has crafted the Latino version of the sound of the Beatles! Caribe Contigo In the caribbean with you! Uribe spent his youth studying folkloric music in his native Colombia. After coming to the US, Uribe formed a brass band. Rather than play Glen Miller melodies, Uribe mixed traditional BIG BAND brass sounds with the folkloric beats of his native country. Uribe has written many songs including Caribe Contigo and Gozar El Dia. Be sure to catch him at the Zinc Bar if you are anywhere near the Big Apple! Sigifredo Pizana is a 19 year old youth who is about to be very alone in a country that has mostly failed to open it’s arms to bright young immigrants. Sigi’s father was stopped by local law enforcement. Soon thereafter the elder Pizana had a date with ICE. After being in the country 9 years and 3 months, the elder Pizana was eight months short of the ten years which might have given him some hope. Rather than spend the family resources on fighting, the family has decided to go to Mexico. That is, everyone but Sigi. At 19, Sigi was enrolled in college with a dream of studying actuarial accounting. When the family fell into crises, the youth had to drop his college classes. But it was about to get a lot worse. Soon, mom and the rest of the family plan to call it quits on the American Dream and follow the elder Pizana to Mexico. That leaves Sigi to fend for himself. When people talk about getting in the back of the line, they don’t realize what the phrase entails. In the first place, for many undocumented immigrants, there is no line. Even if there were, getting in back of the line means dividing families often for decades. Those who go to their native land can’t return and those who remain in the US can’t leave. With border crossing becoming difficult and expensive, upwards of $3,000 in many cases, the family remains apart for many years. Sigifredo very much wants to take the steps necessary to become a citizen of this country. After graduating with honors with AP classes, this bright youth has demonstrated he has something to give to the country. If he leaves, he will be part of the world market which competes against the US. Most people agree, it is better he stay and become part of the fabric of future generations. You can listen to Sigifredo as he talks to talk show host Tim Paynter on Un Dia Sin Fronteras. Joining the discussion will be Richard Hartwell, an Anglo who sides with immigrant youth. Richard says we need to pass the Dream Act so young people like Sigifredo can continue in the journey in the only country they know. Dreamer Fundraising Nearing End, Please Help Make This Movie! Please Help Make This Great Movie! This is a great cause and the movie will help pass the word about immigration reform! Please participate or pass this along to your friends so they can contribute! Together we can do anything, alone we are lost beings. This is a critical message with a wonderful cast of characters! Please help pass the Dream Act! Please be part of history! Stay Current With Our Email List! Free Arizona map, let their tourist board pay! LET ARIZONA PAY FOR A MAP FOR AN ACTIVIST! Video Reports! Breaking news! Features! 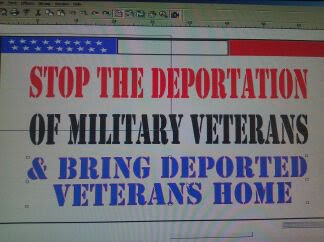 Stop the Deportation of Vets! Tim Paynter On Air=Click Pic! Guaranteed Best Price on electronics! Butterfly! Keep current with RIFA, Don't miss the most recent news! Track our changes, stay current with the reform movement! Tim Paynter Justice Corner=Click Pic! Join the RIFA email list and make a difference! Faith Letter of Support for Claudio Rojas - The post Faith Letter of Support for Claudio Rojas appeared first on dreamactivist.org.